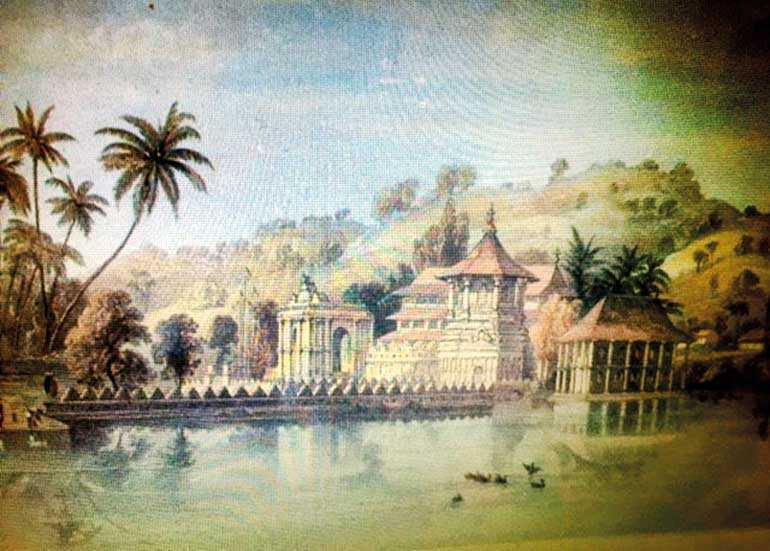 Known as Senkadagala or Senkadagalapura during the time of the ancient kings, Kandy came to be known as Maha Nuwara being the only remaining ‘Great City’ – the last capital of Sinhala kings, with Colombo being under successive foreign powers. It also became the sacred city with the ‘Sri Dalada’, Buddha’s Tooth Relic being housed there. The month of Esala (July/August) is synonymous with the annual Dalada Perahera paying homage to the sacred Tooth Relic following tradition over several centuries. Activities related to the Esala Perahera begin tomorrow with the ‘Kap situweeme mangalyaya’ – a ritual held in the four devales. It is a ceremony when a young jak tree which does not bear fruit is cut and parts of it are distributed among the devales and planted at the auspicious hour. The Dalada Maligawa where the Tooth Relic is housed does not take part in this ceremony. Essentially a Hindu tradition, the objective of the ceremony is to seek the protection of the gods to conclude the Perahera without a mishap. The task of selecting a tree, cutting it and distributing its parts is done by the Vishnu Devale. Once a tree is found, the tree cutter leads a procession with other persons involved in the task. The area around the tree is cleared, nine ‘pahanas’ are lit and flowers kept on nine betel leaves are offered to the tree before it is cut. Clad in white clothes, the tree cutter cuts the tree ensuring that it will fall facing the north. The first part is separated for the Natha devale and the other three to the Vishnu, Kataragama (Skanda) and Pattini devales respectively. Each part or ‘Kap’ is covered with a white cloth and taken in procession to the respective devales and kept on a special dais in front of the devale prior to being planted, at an auspicious time, in a small pit which is covered on all sides and decorated right round with flowers. Three coconuts are kept near the pit and three ‘pahanas’ are lit. While paying homage to the Sri Dalada, the Perahera is also meant to pay respect to the gods and goddesses who are believed to be protecting the Tooth Relic and those attached to the four devales. The Perahera is also meant as an appeal to God Indra for rain. With rain the farmers will start on their crops which in turn, would bring prosperity to the country. The Devale Perahera – processions within the precincts of each devale – will be held until the start of the Kumbal Perahera. Traditionally, the parents in and around Kandy considered the ‘devale perahera’ as the most auspicious event to be shown to newborns for the first time. The ‘Kapurala’ – lay official of each devale – walks in the procession carrying the insignia of the respective deity known as ‘ranayudha’ to the accompaniment of music and drumming along with flag and canopy bearers. The procession goes round the tree planted at the ‘kap situvima’. The ‘Kap’ remains until the end of the final Randoli Perahera when they are taken and sent down the river at the water-cutting ceremony. The Kumbal Perahera starts on Thursday, 16 August, and goes on until Monday, 20 August, when the more glamorous Randoli Perahera begins. 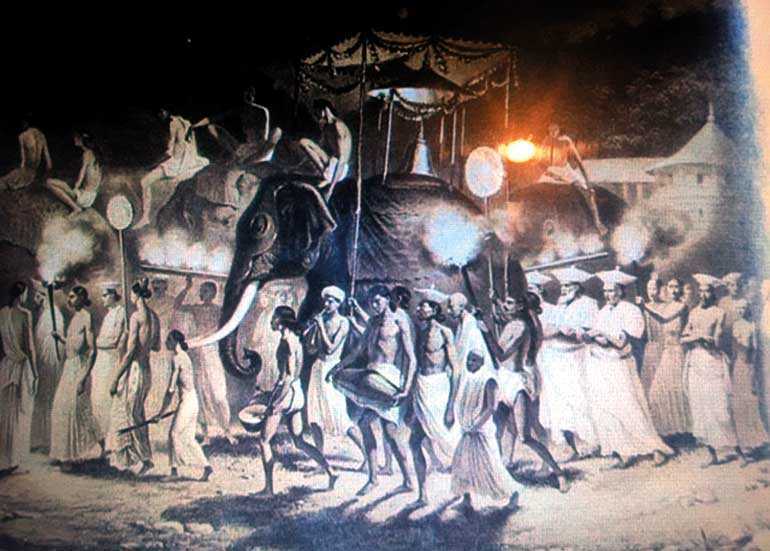 The origins of the Dalada Perahera goes back to the 4th century when King Sirimeghavanna (Kit Sirimevan (301-28 CE) ruling in Anuradhapura ordered that the Tooth Relic should be brought out from its enshrined place so that the public could pay homage once a year. The tradition continues with more glamour and pageantry.